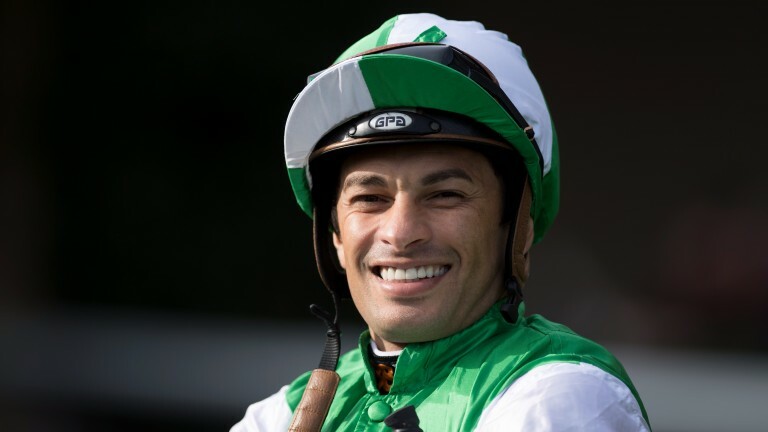 The scale of Silvestre de Sousa’s effort to ensure he was not pipped to the Stobart Flat Jockeys Championship has been laid bare by statistics extracted by the Racing Post that show he had over 100 rides more than any other jockey in Britain in the third quarter of 2017. De Sousa was locked in battle with Jim Crowley 12 months ago, with Crowley's staggering late-season surge securing a first title that paved the way to a remarkable 2017, which brought a top retainer job and significant Group 1 successes. This time around De Sousa has comfortably seen off any competition and despite the lack of a realistic, close rival for much of the summer, has put in a concerted effort that is comparable with Crowley’s to rule out any chance of a late upset. De Sousa took 487 rides from July to September, 101 more than his closest rival, the renowned workaholic Luke Morris. That figure compares with Crowley’s 477 during the same period in 2016, with De Sousa himself having ridden 383 last year. Crowley, meanwhile, has ridden only 337 in the same period this time, with his season based more around the ‘quality over quantity’ mantra this year. 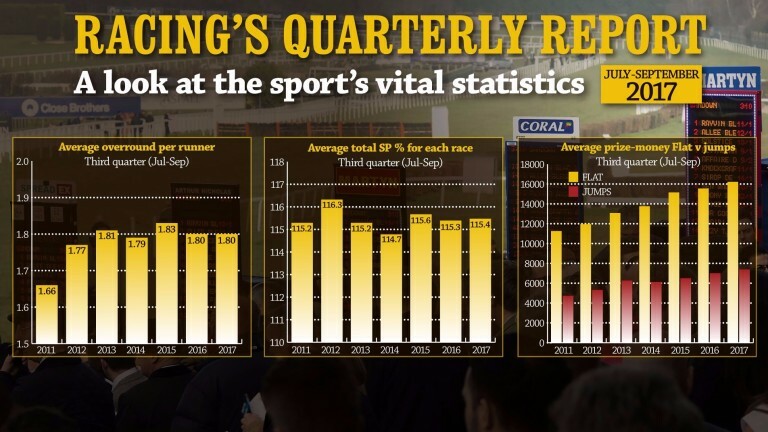 Elsewhere, Richard Fahey was once again the busiest trainer during the late summer, sending out 738 runners, 171 more than his closest rival, Richard Hannon. In fact, although the numbers differ slightly, the six busiest trainers in the third quarter of 2017 (Richard Fahey, Richard Hannon, Mark Johnston, Tim Easterby, David O’Meara and Kevin Ryan) are the same as they were 12 months ago. 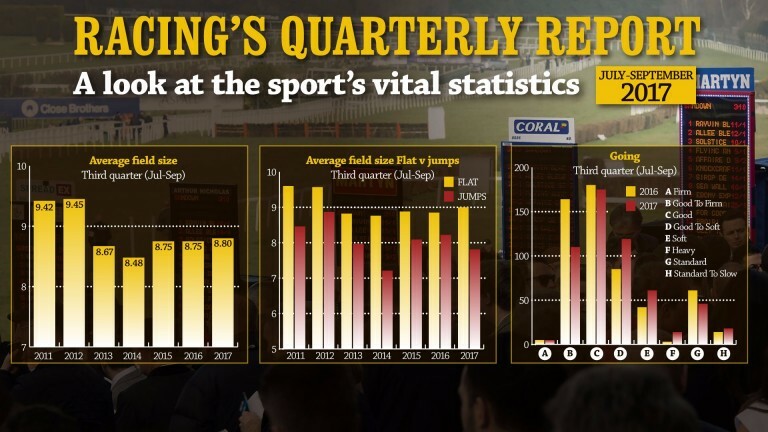 Average field sizes on the Flat rose on the corresponding period of 2016 but were down marginally from the 9.06 of the second quarter of this year to a round nine. 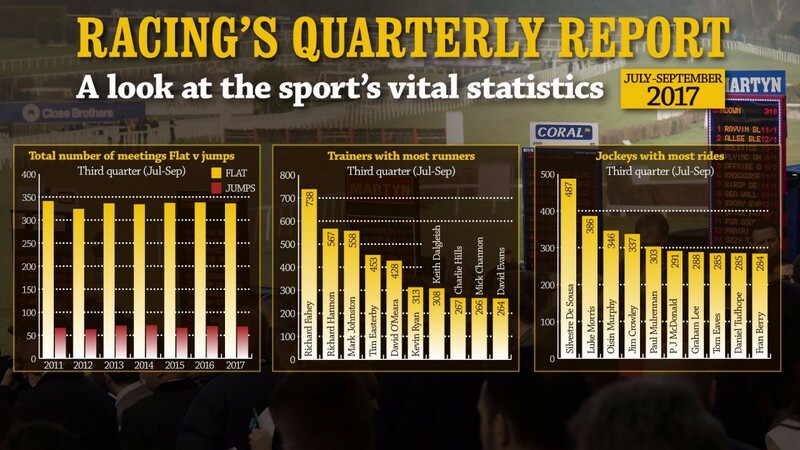 Jumps fields, meanwhile, rose slightly but remained below the desirable eight-runner mark to sit at 7.81, down from 8.22 last year. On the Flat, average prize-money was up on the same period of 2016, from £15,549.59 last year to £16,221.68 this.